(Newser) – "It's definitely made me reconsider everything. Who was I before? Who was I then—is that part of me? Who am I now?" 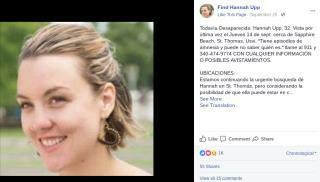 The New York Times reports Hannah Upp, a 32-year-old teacher in St. Thomas, disappeared Sept. 14, a week after Hurricane Irma hit the Virgin Islands. Her clothes, car, keys, cellphone, passport, and wallet were found at a beach where she had gone for a swim. Upp was still missing five days later when Hurricane Maria battered the Caribbean. Upp is far from the only person missing in the wake of the storms, but her case is unique in that she may not even know she's missing. Upp has dissociative fugue, a very rare type of amnesia made famous by the fictional Jason Bourne. "Normally, we forget things in little pieces," Dr. David Spiegel says. "These people forget things in large pieces that involve what they've done for the last year or two years." But Miss, I turned in my research paper AND got an A+ !! I was so proud I mailed it to my grandma in Australia, thats why I can't show it to you now. You must have forgot to record my grade, but thats ok, just mark it down now, after all it is 25% of my over all grade, and I can't get it back from granny till sometime next year. Doctor: How long have you had the amnesia? Patient: As long as I can remember.